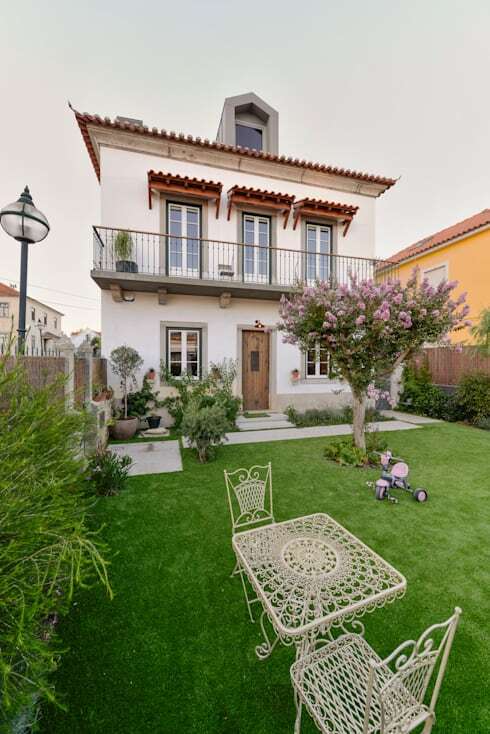 This house in S. Pedro do Estoril, Portugal, was built in 1923 and was lying in a dilapidated and shabby condition before the architects at Ricardo Moreno Arquitectos decided to give it a ravishing facelift. The exterior walls made of stone masonry were preserved by plastering them with clay mortar, lime and crushed cork. These eco-friendly materials not only make the walls breathable, but also help in regulating the indoor humidity. Both the facade and the interiors look charming and contemporary now, but they embrace vintage and rustic elements as well. 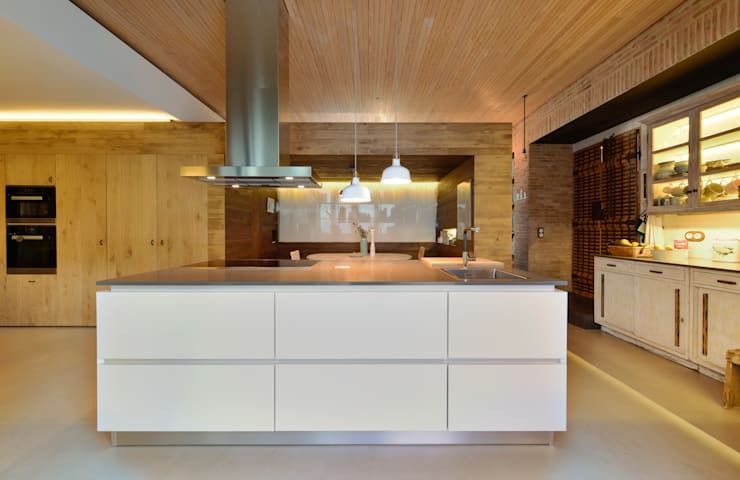 Wood has been used lavishly and aesthetically throughout the property along with sober, soothing colours, and trendy designs. All in all, the residence is stunning and cosy. The white facade is replete with old world charm, thanks to the quaint long windows, wooden entrance door and shingled shades. The lush and lively garden is full of various plants and a picturesque tree with pretty pink blossoms. White wrought iron garden furniture offers stylish seating and adds pizzazz here. 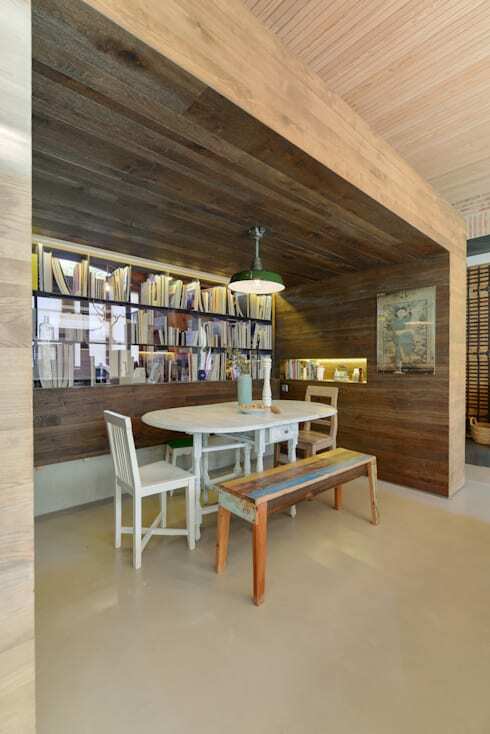 Rich wooden design elements and furniture add warmth and homeliness to the white touches inside the house. An open plan layout allows the living and dining areas to merge beautifully, while the wooden staircase lends the kitchen a bit of privacy. A fashionable white island, practical cabinets and modern appliances make the open kitchen a very convenient and inviting space. Powerful yet soothing lights contribute to the warm ambiance, while the smooth floor looks very smart. 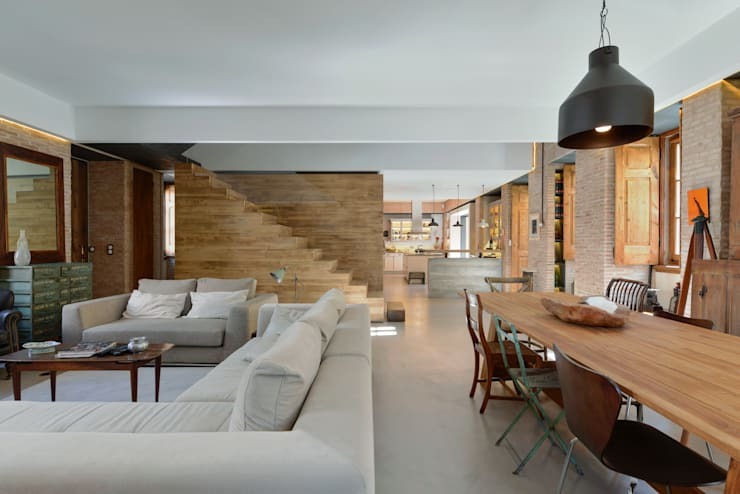 Brick and wooden elements lend earthy appeal. A solid-looking wooden alcove makes a cosy nook for the dining arrangement, which looks stylishly vintage. But what steals the show here is the illuminated bookshelf, tempting you to crack open a book while you enjoy a lazy meal. On the other side of the dining alcove, you will find the airy and sun-kissed home office. Trendy furniture invites you to take a seat and get productive, while large glass windows bring in the sun and fresh air. 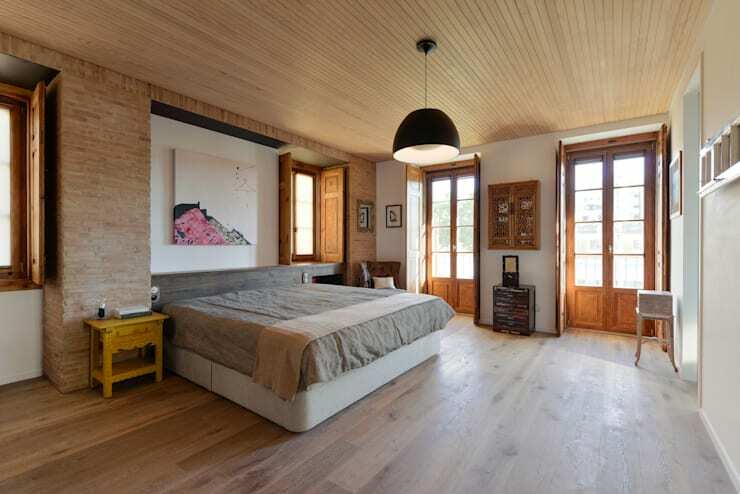 With quite a number of French doors and windows, the spacious bedroom uses brick and wood for a rustic and elegant look. A quirky artwork hangs over the plush bed, while vintage storage units add personality to the bright room. 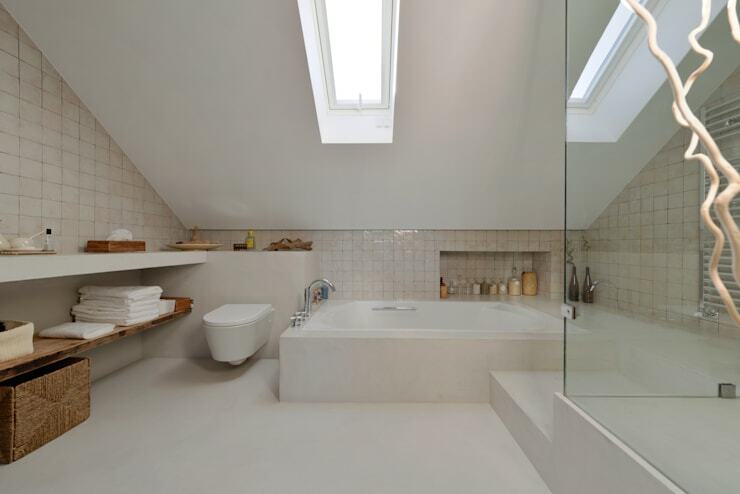 White dominates the expansive and bright attic bathroom, while modish sanitary wares make for a stylish statement. A large tub and spacious shower enclosure let you choose the mode of refreshment as per your mood. Sleek, long shelves offer storage along with simple ledges and niches. A touch of wicker and wood help the bathroom to celebrate the rustic spirit of the home. 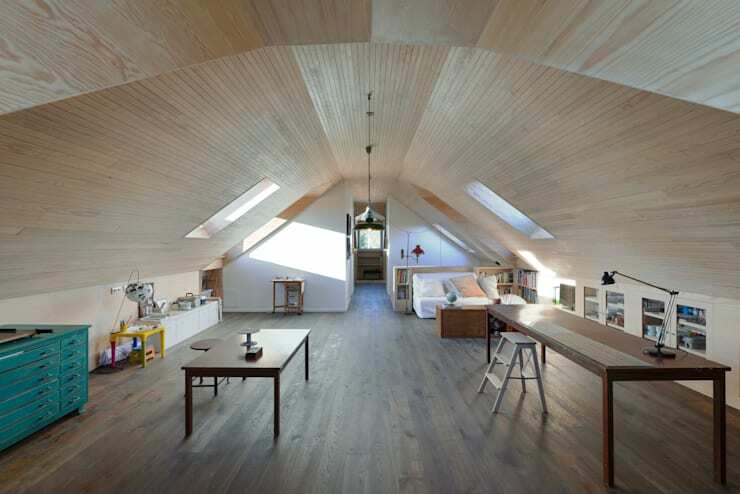 The ceiling of the loft is simply exclusive, with large skylights bringing in oodles of sunlight and fresh air. 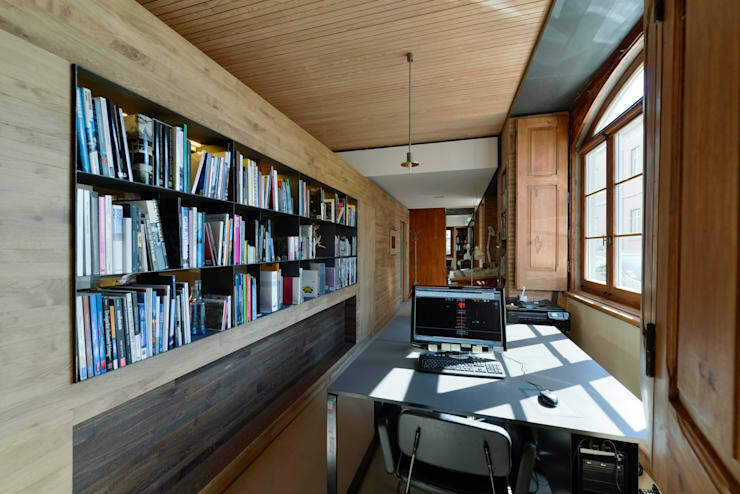 The furniture chosen for this space allows you to laze around or work on a DIY project with equal ease. 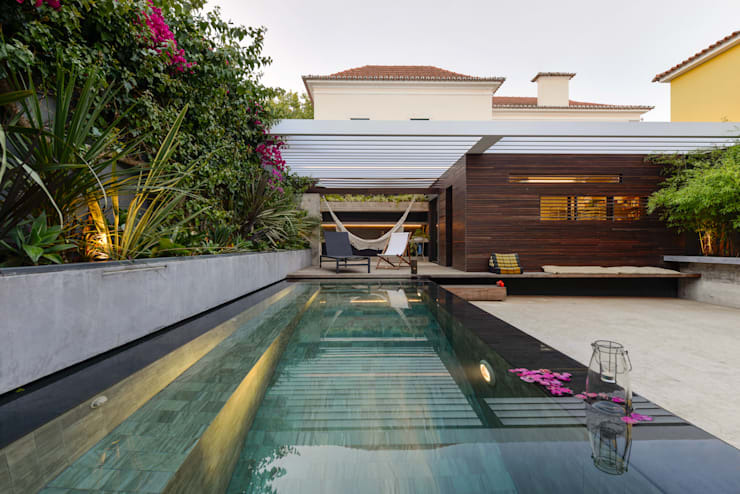 The expansive backyard combines wooden elements with a stunningly clear pool, magical lighting, lush vegetation and cosy outdoor seating to paint the picture of paradise. You can simply sunbathe or relax here, take a refreshing dip in the pool or host exciting open air parties. Wowed by this remarkable home and its gorgeous nooks and crannies? We are too! Take another tour for more ideas - This Grand Home Makes A Powerful Style Statement.